I love that you do! Thanks Louise! I’m sure you slay every ride! I just rejoined and im glad to have found this spin to get me going again! I don’t care that it’s almost February-I love this ride! Thank you for making my short workout time today so good Cat! Decided to do a post Christmas work out to this playlist. First playlist to kick off my post pregnancy exercise! 34 degrees in Australia and loving it with this playlist!! Awesome Jade! I’m sure you’re lookin mighty fine & send us photos of your baby!! Love this class. Did it three times – and I’m Jewish! HW2019 A belated merry Christmas! Likewise Karen! Hope you had an amazing holiday season! HW 2019 #4 – that was one heck of a 36 minute ride. HW2019 #3 Fun!! Great playlist!! Had tears but it’s all good! Thank you!! Aw Jayne! Tears can be a good thing!! I love your classes! I did my spin 2x so far this week. I’m shooting for 5x thank you Cat. You got this Kim! I believe in you!!! Loved this! I did this multiple times in December! Hope you put one out every holiday! Awesome Adrienne! I guess I’ll have to now! A very Christmasy workout, cheered me up! Great sleigh ride Cat! You are awesome as always!! Riding with you up here in the Adirondacks, took a pass to hike a local snowy mountain with my boys to get some summer fun with you in San Diego, haha. And my pug Ella enjoyed chilling next to me all along:-) Happy 2019 and thank you for Studio Sweat!!! Awh glad you made time for us but go hiking with your boys next time! That sounds just as fun 🙂 I want to see your pug!! Happy New Year Joan! Thanks for a great workout Cat! Merry Christmas to the team at SSOD. I am 20lbs down this year and looking forward to building more muscle with you all in 2019!!! Celena that’s incredible! Can’t wait to see where you go in the next year! Merry Xmas. Mmc2018 so fun for Christmas Day! Merry Christmas! I think I’ve found a new Christmas morning tradition with this Slay Ride! I’m giving myself the gift of fitness! Thanks for a great workout! Mmc2108#21–super sweaty Christmas! Merry Christmas! Have to stay warm somehow 😉 Merry Xmas!! I had an hour before heading out to Christmas Eve Mass. Thought “what better way to spend that hour knowing how much food tomorrow brings?” 🙂 I love these 30 min workouts for this very reason. I wouldn’t have done anything if it took an hour. Plus this is such a great holiday songlist!! And you feel like you worked out for an hour! Thanks Kat! P.S. I knew all the artists and would have won the 5cents wink,wink. P.S.S. I treasure my parents more now than ever since they are in their 80’s and so fit. I still get to celebrate with them which is more than I can say for so many people. Merry Christmas to you and all your amazing staff. MMC2018 #12! Great way to celebrate the season! Loved it! Fun is the only way I like it 🙂 Merry Xmas! Since it’s officially Chrstmas Eve, it is only fitting that I do the SLAY ride before decorating the tree, and heading to Church to lead Worship! Thank you Cat for the great play list, and push! Also, thanks for remembering all who are sad this time of the year. There were a few tears as I remember my dad who died two years ago at the young age of 66. Hope you had an amazing Christmas Kevin & so sorry to hear about your dad. Your SSoD fam is always here for you! MMC2018 #12! Great way to finish up this challenge! MMC2018! Seemed only fitting to end with Cat’s Christmas spin! Thanks for being a part of all this Andrew! I couldn’t do it without you! 🙂 Hope you had an amazing Xmas! I’m the biggest scrooge but i really enjoy these christmas spin classes you guys have. Cat and Brian just know the best music to pick for a great class. And we also know how to get you in the spirit! Hope you had a great Xmas, you Scrooge! I think Kat should just sing to us while she spins. Great voice! MMC 2018 – just love doing it!! won´t you guide my SLAY ride!! Merry Christmas! Hope it was spectacular like you! MMC2018!! Again!!! Finished it off with Brian’s Christmas spin!!! No better way to spend time while the dough chills!!! Another Christmas tradition!!! Right!? Hope you had a wonderful Christmas Nicky! Right!? Thanks for groovin with us! Fun class and I think everyone loves Feliz Navidad! I know I do. MMC 2018 # 13! Had to do this one again seeing it’s almost Christmas! This one and Brian’s till Christmas Day! Merry Xmas Danielle!! Enjoy your day with your fam! Loved this class ! Thank you so much. MMC2018 #11 – loved it so much I had to do it again! MMC2018 #14 ** and this weeks HOW done! So awesome! Cat’s energy is so infectious as usual! MMC2018- #15 Loved this one so much I did it again! MMC2018 #11 – Slayed this one for the second time! Cat – I need your shoes. What kind are they? Nice job AGAIN Dana – they’re Pearl Iszumi X-Road shoes. MMC2018 #10 – Thank you Cat! MMC2018 #13 – Slayed it! MMC2018 #17….SLAY GUUUURRRRRL SLAY!!! w00t w00t!! You’re slaying just as hard Liz! MMC2018. Loved this way to celebrate the season! Was it just as challenging?? MMC2018 #10 – so sweaty!!! MMC2018 #19: perfect class to get in the Christmas mood! MMC2018, Fun class! Thanks Cat! ha I never said it’d be easy 😉 Don’t be fooled by the xmas music! LOVED this class Cat!!! So fun!! Thank you!!! MMC2018 Repeater Christmas ride – good for my mood. good for my soul! Yes yes, merry xmas Sue!! MMC2018 #13!! OK Cat… If the front row are the horses and the back row is the sleigh… that must make you Rudolph 🦌?? 👏👏👏😂😂😂….LOVE the class!! LOL I guess so 😉 Thanks for slaying with us Rachel! So glad to hear that Anna! Merry xmas!! Thank you Cat! That was fun and needed – your Christmas music works great! Right!? Who knew it’d be so motivational!! MMC2018 workout #18. Cat as always you keep us motivated throughout the whole workout!!!! MMC2018 #2 nothing like a little procrastination! LOL I will finish all 12 before Sunday. Heck yeah you did! Indulge & enjoy because you deserved it! MMC2018 #20 – Such a fun ride! You contributed to the fun Laura! MCC2018 #8 love this ride love this playlist!! MMC2018 #9. It’s been 7 years since I lost my Mom and Christmas is still so hard without her. I’ve never actually bawled during a class, but I did today. I slowed down, but I didn’t stop. Thanks for an inspirational ride, Cat! Stay strong Andrea. We’re in this together <3 Thanks for being a part of all this & wishing you the best holiday season. This was sooooooo FUN!!! Thank you Cat!! MMC2018 #9! Beautiful class, I will be doing this one again! And, another fun sweaty class! Thanks. Too sweet 🙂 Surprised you’re not bored with me yet! MMC2018 #12 done. Great holiday class! Mmc 2018 #8. Wow. Fun. Hard. Ready to do it again! Thanks for riding with us Nicolle! MMC2018 #6 – did it on Dec 10 but forgot to log it!! No worries! Better late than never! MMC 2018:#12. Had to do this one again love the music and oh by the way awesome workout! Thanks Kerri! Glad you enjoyed even the second time round. MMC2018 #11 Just as good 2nd time round! MMC2018 – fun and festive class! Right!? Trying to bring that holiday cheer! MMC2018 #8 enjoyed this so much the first time came back for another round. Looking forward to the next Christmas ride on Saturday!! Let me know what you thought of it!! So glad to hear that Rachel! MMC2018. #9! Love this one!! MMC2018 No. 6 Christmas sweat is ON! What a great way to spend 40(ish) minutes! So much fun! I’m a sucker for Christmas music all year long…instant pick-me-up for me. 😉 Thank goodness no one was watching me because I was smiling like an idiot the entire time. MMC 2018 #10. Just as wonderful the second time around. Too kind 🙂 How about a third time round? MMC2018 #5 Love your determination to find Christmas cheer! MMC2018 – #9 Loved it! Thanks for riding with us Melissa! MCC2018#7 so fun Cat! Loved the music and loved your energy … merry Christmas!! Merry xmas Corilee to you & your family! Second time on this wonderful sleigh ride! What an absolute joy! Thanks, Cat! Oh sweet Cat…thank you for that joy-filled workout!!! I miss my mom too! <3 hang in there Sally. I'm with you! MMC 2018….WEEK 3. #1 OF THE WEEK. Thanks for riding with us Jody! Mmc2018..thanks for a fun ride! Fabulous SLAY ride Cat! I am sorry about your Mom. She raised a wonderful daughter! Holiday best wishes from the frozen north! Means so much Allison. Thank you & Merry Xmas! Nice Marcus! I’m holding you to it! MMC2018 #7 – so much fun!! Thanks Cat! MMC2018- LOVED this! Thanks Cat. I will do this one many times the next few weeks! Glad to hear it Ashley! MMC2018 #14 – Just as fun second time around! Love the playlist! Thank you for a great workout and Christmas cheer! Of course Aida! Happy holidays to you & your family! I’m with you there! I miss snow!!! MMC2018-Christmas ride with Cat!! Awesomeness!! I’ll be singing carols all day- May need to play it again just for the playlist!! Thank you!! Ha love it! Lmk if you want our playlist! Fun, intense, challenging and sentimental. What more do you need!? MMC2018 #9 – feeling festive and reflective. Great class Cat – thanks! Thanks Helen 🙂 Happy holidays! MMC2018 #9 – I loved loved loved this playlist and the workout was just what I needed after a long day at work. MMC2018 # 5 – Fun class! I can see doing this one again before Christmas. Thank you, Cat! MMC2018 #9. Great class as always, thanks, Cat!! MMC2018. Great holiday tunes. Thanks Cat. Legs are spent. 😬. So fun! But I feel like you need one more Pre Christmas with Kylie’s TRUE Summer Christmas song ‘it’s 100 Degrees! !’ In honor of Australia where it’s 35 degrees Celsius at Christmas time!!! LOL thanks for the suggestion Renee! first clss on the bike from the gym in my HOME. it’s a lot easier to sweat and spin in my room than at the gym. MMC2018!! Finally after a week of being sick I got this in!! I was looking forward to it so much and it did not disappoint! Fun and hard all at the same time. Thanks for the shout out Cat! You were right you gave it to me just when I needed it the most!! Merry Christmas. Looking forward to the live right on the 15th. MMC2018 #11. Great fun workout! Feel good inside and out. That’s exactly what I want to hear Carrie 🙂 I’m sure you’re glistening! MMC2018 #7 and 50 mountain climbers! Well this certainly got me in the Christmas spirit! Merry Christmas everyone….. Right!? Keeping our workouts merry & bright this season 🙂 Merry xmas! Most fun you can have burning calories!! Right!? Who knew sweating would be such a blast!? MMC2018 #7 WEEEELLLLL that was AWEEEESOME!!!!! Made me smile and sweat!! LOVE IT!!! Thanks for contributing to the fun Karen! As you should be feeling! Merry xmas to you & your family Jim! You bet Anna! You slayed! Great festive upbeat enjoyable workout! MMC2018 #6 This was soo much fun!! Can’t wait to do it again! Too kind 🙂 Happy holidays Whitney! Quick spin that works you hard!! MMC2018 #10 I love Christmas music, so that flew by quickly. Thanks Cat and Happy Holidays to all !!!! Don’t we all!? Happy holidays to you & your family Diane! MMC2018 – 2018 #8/12 – Great class, how could it be bad when you’re sweating to Christmas tunes??!?!? Thanks Cat, Merry Christmas to all! Ha we gave xmas music a whole new purpose!! MMC#2018 workout #10 – put me right in the holiday mood! MMC2018 best Christmas slay ride ever!!!! Love the high energy! 💖 you are the best, Cat! MMC 2018… so much fun and a great class!! I love your joy! It’s so infectious! Too sweet 🙂 Just trying to spread the cheer! Thanks for slaying with us! MMC2018 #4. So fun. Thank you. I lost my Dad almost exactly to the day and I can relate how difficult it is to losing a loved one during the holiday season. <3 taking it one day at a time. Stay strong Wanda. Awesome class with a great playlist! That’s so tough but stay strong Sharon. <3 We're here for you! MMC2018 #5 Slayed it! Thanks for a festive (and sentimental) ride. MMCF2018 #9. <3 <3 <3. This was so FUN, even though I now feel wiped out. Cat, your energy and playlist had me going ALL out. Thank you for another wonderful class…and Christmas to boot! MMC2018-#9 loved this, felt like a party! Flew by! MMC2018 #13 This will be my third Christmas without my mom. You definitely made me cry, but then lifted my spirits right back up! Great class! MMC2018 #7. Can’t remember if this is my number 7. I do know I performed 4 workouts this week plus taught 3 exercise classes. Crazy week and I am forgetting to post! My bad if I created confusion! That was awesome! Great ride for this Christmas elf! LOL! The cutest Christmas elf there is!! MMC2018 – #4. Fun ride, loved it and I am not pretending :)! MMC2018 #5 Joyful way to start the day. Right!? Hope the rest of your day was just as positive! MMC2018 #9 – I forgot to put 2018 in my previous comment. Oops. MMC #9 – How fun was that?! Now I’m to go Christmas shopping today! Ho-ly moly! I loved that spin!!! Great music!!! Thank you Cat!!! LOL I love it Christy! MMC2018 #6. Absolutely loved this ride. The Christmas playlist was so much fun and it was a great, sweaty workout. Nothing better than that! Right!? If only we could play xmas music all year! Just what I needed this morning! Loved your music! Thank you, Cat, for bringing the cheer! So kind Karen. <3 Glad you resonated with the Nutcracker bit. Merry Christmas to you & your family! MMC2018 #8 Completed yesterday. It’s beginning to feel a lot like Christmas! It’s the time to be festive!! MMC2018 – #18..BSP..Awesome spin Cat and a Merry Christmas right back at ya. Merry Xmas to you & your family Michael!! MMC2018 Loved this Cat! Looking forward to the next one on the 15th! Merry Christmas! Glad I can leave you smiling after a sweaty workout Esther! Happy holidays! Right!? Too fun. Stay strong Jan, we’re with you! MMC2018 #7. Loved this class!! Yes yes! Merry Christmas Sam! MMC2018 I can’t put into words how much I loved this class, especially the “where are you Christmas” set. I didn’t realize how much I needed that. Thank you so very much! We all needed it Tiff! Happy holidays!! 🙂 Thanks Gordon! Merry Xmas! MMC2018 #10: loved the playlist! I was shouting CeeLo Green from my basement! This class is full of holiday cheer and humbug free! Thanks Cat! Shout it to the rooftops Lisa! MMC2018 – #16 – I love the music and your cheery smiley attitude. I was laughing and crying (for a song or two). Thank you Cat! Too sweet Janet! You weren’t the only one. That’s for sure! MMC2018 #6. Thanks Cat! Best wishes to you & your family this holiday. Thanks Cat! I am from the uk but live in NZ and totally understand about the hot Christmas thing !! I really miss a cold Christmas!!! I should just do winter things anyway !!! #MMC2018 #8 – super festive! Tis the season to be festive! MMC2018 #8 I lost my Dad 1.4.08, his birthday 12.23. I feel you. It is a happier time again. Stay strong Jenna <3 we are here for you! MMC2018 #7… can you say Red Zone!! Holy cow and Merry Christmas Cat!! Got to get out of that comfort zone once in a while! 😉 Merry xmas! MMC2018 #7 Feliz navidad – great playlist and spin class! LOL I’m sure that’s not true!! I adore u Cat!!! Thx for all the great workouts. U r so fun to workout with even on a iPhone! & I adore YOU! Ha I love it! MMC 2018 Thanks so much for doing this. I worked hard and had a great time! Ialdo appreciate you acknowledging those who have a hard time at Christmas time. My mother is one of them and it was a good reminder to be patient and loving to her. MMC2018#5 – Lovely music and fun class – your goodwill and kindness are appreciated. Happy holidays! I appreciate you just as much Paige! 🙂 happy holidays!! Such a great ride!!! Mid-ride here in Pennsylvania it started to snow flurry ❄️💙❄️ Perfect combo! So jealous! I miss snow! MMC2018 always love your classes, Cat! Merry Christmas SSOD!!!! Aw Bernice! Always appreciate your comments 🙂 Merry xmas! MERRY CHRISTMAS to you Crystal!! MMC 2018:#8. Loved the elements of this spin and loved the last song great way to end a slay spin! MMC2018 #10 – Merry Christmas! It’s fun riding to Christmas music! Right!? We should ride to xmas music every day!! MMC2018 #5 so much fun!! Right!? Thanks for riding with us Holly! MMC2018. Thanks be Kat for a “short and sweet” spin. I’m looking forward to Dec 15th for your new release. MMC2018 #12 So much fun!! Loved it!! Mmc2018 such a fun ride! #MMC2018 #4 done. This class was soooo fun!! Thanks for riding with us girl! Awh no tissues will be required for the rest of the holiday season…unless it’s sweat you’re trying to wipe off 😉 promise!!! Glad to hear it Melissa! MMC2018 – #11 complete – such fun! MMC2018 #7 – Loved this workout!!!! MMC2018 #6! Loved everything about this class, Cat – particularly the song by Fun (which I yelled out before everyone else 😜) and I loved that you recognized the folks who might be struggling with the season. ❤️ I have some people in my life I need to be checking on. Thanks, Cat!! I love it!!! Of course Shannon <3 those that aren't here with us today cannot be forgotten. Happy holidays & I hope you're spending it with the best!! Right!? We’re getting into that holiday spirit! Thanks for the awesome class Cat!!!! I’ve been looking forward to this one!!! It was amazing!!! We can’t forget about them Natalie! Happy holidays! This is just the beginning 😉 Of course, Reena! Wishing you & your family the best holiday season! Ha I feel you girl! MMC 2018-Nice warmup ride before another speed spin with Cat!!! Right!? Glad you’re getting those warm-ups in! MMC2018!!! That was so much fun!!!! I did Brian’s class right after!!!! You’ve started a tradition!! MMC2018. #8. Best present ever!!! Cat slayed it for sure. Festive, fun and a fast way to build up a great sweat. Will come back to this throughout the season and year after year!! Thank you SSoD. MMC2018 #11 Wooohooo!! Feeling a little morCe Christmassy and a lot more sweaty. Merry Sweaty Christmas, great class Cat! MMC2018. Thanks Cat, that was such a fun ride! Merry Christmas to all! MMC2018 #9 done. That was so much fun!! MMC2018 #6 loved the music and the ride. So glad you did Kim! MMC2018 #6!! I just like to spin, spinning is my favorite!!!! This was such a fun ride, I was drenched in sweat by the end, definitely staying in my rotation till christmas!! Ha glad someone else has a similar obsession 😉 glad to hear it, you got this girl! MMC2018 #6 – Super fun and nice introduction to new Christmas tunes from this mom of only boys! YES Sue! So happy you enjoyed it & found it meaningful. Thinking of your family this holiday season <3 stay strong! MMC2018 #9 Merry Christmas, Cat and Studio friends ! Joyeux noel ! I believe…I’m gonna have a nice, sweaty Christmas! Thank you to all the elves at SSOD for giving us presents all year long. These classes are all I have on my wish list. MMC2018 #6 great sweat with some tears….thanks for a great ride with thoughts of my father that has passed!! Merry Christmas to you and the komrad clan! Of course Marcy <3 stay strong & know that your ssod fam is here with you! Cat, what a great class. Thanks so much for the shout out about remembering our loved ones lost. I lost my mom a few years ago, my brother last year and my dad this year. It can be tough but then I do a class like yours and it brings a smile (a sweat!) to my face! Thanks again. Stay strong Kerry <3 we're thinking about you & your family this holiday season. I want to thank you for a merry workout from the bottom of my heart! This was awesome!! Quick and cheerful burn, thanks Cat! MMC2018!! Love the slay ride!! That was outstanding. So much fun and energy. love spinning to Christmas tunes. Thank you! I will do this one again tomorrow! They really get you in the mood 🙂 Let me know how it went the second time round! MMC2018. #10. Loved it Cat! Will take this slay many more times! Such a fun ride Cat! love me some Christmas AND a great workout! A lot of sweat and it went by fast. 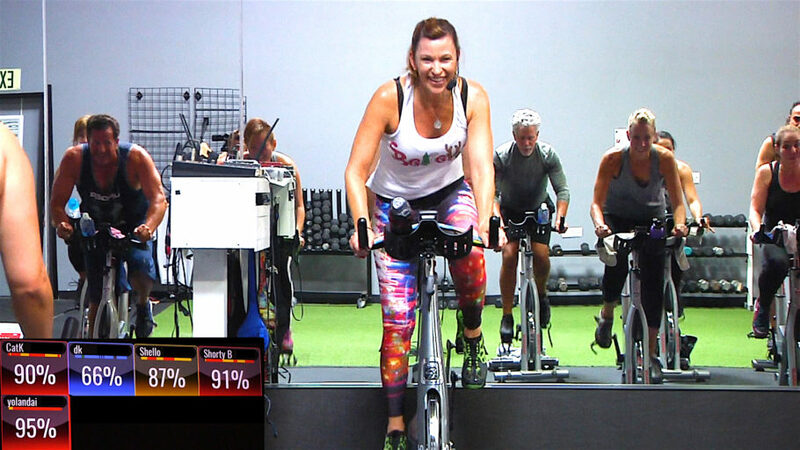 Think fast and fabulous in this incredible “get it done and have some fun” SpeedSpin® led by Spitfire Trainer Bethany. In only about 30 minutes she’ll motivate you to cover some serious ground. Expect to conquer several awesome cycling drills that’ll leave you wiped out, but energized, sweaty gross, but sweaty good and just flat out amazed at what just happened in such a short amount of time! Grab a towel and some water for the ride; it’s gonna be a good one. 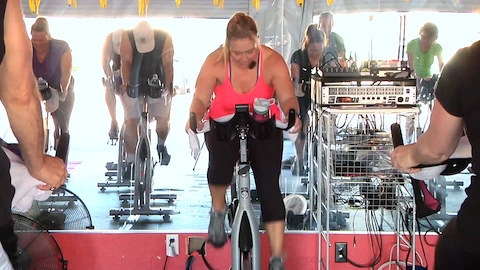 This just over 20-Minute Spinning Class packs a punch in a crunch! You’ll get in some jumps, sprints, and hill drills, attacking each with intensity and mental toughness. Let’s get after it! Welcome to the Cycling Wonderland! Here you will be greeted with a challenge to bring your best; rewarded with heart-pumping cardio; given comfort while sweatin’ along with the class; and encouraged to pump your fist like a champ when you finish healthier and stronger than when you started. We start with jumps to get the blood pumping, then move right into intervals, sprints, and whaaaat… more jumps! 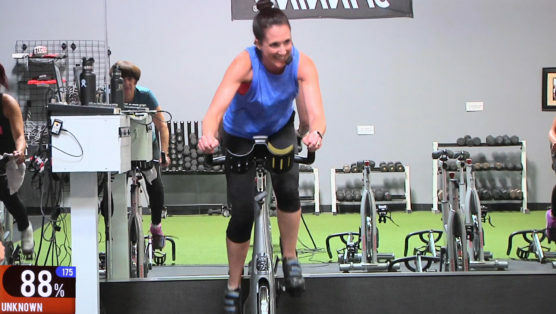 As the finisher, Brian uses some fun visualizations to encourage riders to push themselves to their max on this short, but sweat winning Spinning class. Just listen and ride. Take away one sense and be amazed with how heightened the other senses become. In this case, we remove the visual component (no need to look at the screen) and the heightened sense will be your hearing. You’ll be so focused that, even for those of you that don’t normally hear a song’s tempo, you’ll find your legs pumping like cylinders to the beat. We even offer a visual guide to help you grab the beat if you need it. If you look at the screen in the first 30 seconds of each song, you’ll see a music note – each time it flashes, you should feel your right leg come over the top. It’s just a good gauge to help you pick up the beat, then go back to just listening. 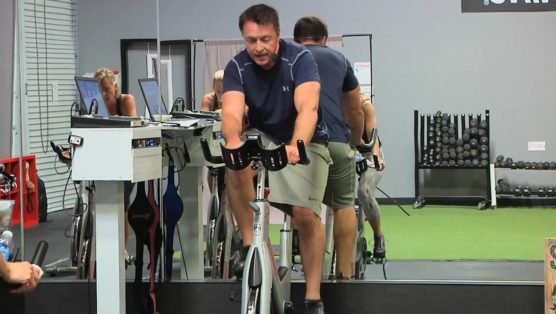 This ride is designed to be a moderate intensity ride, where your level of perceived exertion should begin at about a 6 out of 10, and max out at 8.5 out of 10. It’s great for a “Just break a sweat” day, or even a recovery ride. So listen up and enjoy the ride.